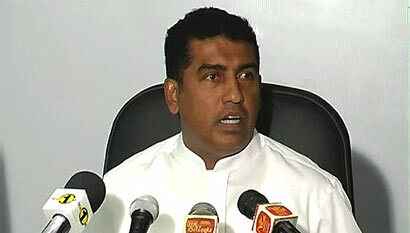 Minister of Co-operatives and Internal trade, Johnston Fernando stated that Sathosa achieved 18 million of profit, by its latest project to deliver house hold grocery items door by door. In addition minister stated that grocery items such as rice, dhal, green gram, cow pea etc can now be obtained from the mobile outlets at customers’ door. Furthermore minister stated that the mobile service will be augmented up to every village by increasing the mobile outlets in future. Where did you get that name from? So you are distributing mung-ata to the villagers of Sri Lanka. Hey Johnston, by the way, they don’t need your stupid mung-ata, my dear friend, they have their own from their gardens. Hey Johnstom, thamaa parana UNP kaarayek ney the? Isn’t it time to move my dear, to the MY3 team? Your friend Rajitha is a big boss there and maybe, if everything goes well, he can organise a couple of rice mill licenses and liquor licenses for a few buckshees, (Rs 200m).